THIS DOES NOT MEAN YOU GET TO SHUT YOUR BRAIN OFF. UPGRADING FREENAS COULD STILL RENDER YOUR CHANGES NULL AND VOID. AFTER ANY FREENAS UPGRADE, VERIFY THAT YOUR CHANGES ARE STILL IN EFFECT EVEN WITH THIS STICKY HACK IN PLACE. Part 1 of trying to get hacks to FreeNAS to survive an upgrade was a failure. But never fear, I went back to the drawing board and had great success tonight. Basically I changed my approach slightly, Instead of trying to make changes to /conf/base/etc/rc.conf , what ended up working was just making the changes to /etc/rc.conf on every boot. This will have the added benefit of working even if the FreeNAS developers change their naming scheme again for things in /conf/base/etc. 1. I have OpenVPN and pf Firewall enabled, neither of which are stock to FreeNAS. You’ll need to adjust this script to meet your needs. Open up your favorite text editor and save your hacks.sh file somewhere on your data drive on the FreeNAS box. First thing is lets search /etc/rc.conf to see if our hacks are in place. If they are, we exit. Now, the else section is where we add our hacks back in to /etc/rc.conf when they are not there. I’m just using a simple echo command to write the line I want to add to the shell and then am adding it to the end of /etc/rc.conf. I’m adding a blank line before my hacks, some notes about the hacks I’m adding and the config changes. You will need to change the paths to pf_rules, openvpn_configfile and openvpn_dir to match your setup. 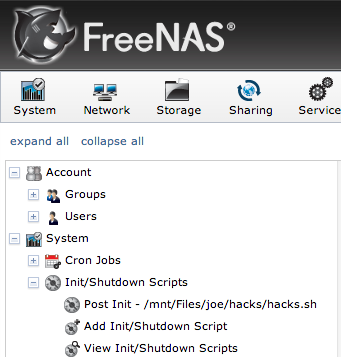 Next we want to start the services that we have added as hacks to FreeNAS. For me that is pf and openVPN. Last thing is to close out the if statement with fi. 2. Now we need to make our hacks.sh script executable and make it owned by root for good measure. Make sure to change the path below to match your setup. Set up the FreeNAS GUI to run hacks.sh as an init script. You want to select script in the first field. 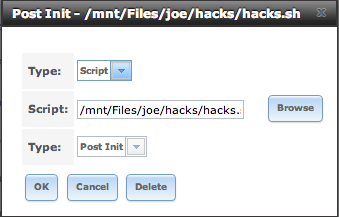 Browse to your hacks.sh script and select it in the second field and select Post Init in the third field. 4. Reboot and watch the magic. 5. After you’ve rebooted, check the status of your hacks. openvpn is running as pid 17535. You should get this if you are running pf. Notice that is says enabled. I set this up and tested it in a VM that started out as FreeNAS 9.2.0. After setting this all up, I did a system upgrade using the GUI and upgraded to 9.2.1.2. After rebooting, I checked /etc/rc.conf and my changes were in fact still there. I then checked to see if pf and openVPN were running and they were. SUCCESS!!! I hope you all enjoy this. Let me know of all the great ways you find to use this. The recent NTP reflection incident I was a victim of woke me up to the need for securing my FreeNAS boxes from outside connections. Luckily, FreeNAS 9.2.1.2 comes shipped with the kernel extension for pf, so getting it working is pretty easy. If you are going to do this on your FreeNAS box, please also check out my guide on getting hacks to FreeNAS to survive system upgrades. I’ve been told that pf does not play nice with vimage jails. It tends to cause kernel panics. 1. Mount the filesystem so we can make some changes. 2. Figure out what interfaces you have active so we can add them to the firewall rules. 3. Create the pf.conf file and edit it to your needs. We are going to put it on our data drive so future FreeNAS upgrades don’t wipe it out. Adjust the path to match your setup. Here are the rules I am running. pass in on $ext_if proto udp from any to any port 1194 keep state label "openvpn"
4. Edit /etc/rc.conf and add the following. 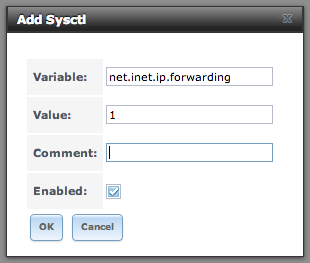 Then make sure to go into the FreeNAS gui, click on System, Click on Sysctls. Then add that same value so it survives reboots. To really make these changes stick, follow my guide on the subject. An added benefit of setting up a firewall this way is that it will let you route to other computers on your LAN over your VPN. Hope you all enjoy this and let me know how things work out for you.